He and his wife Megan (who is the Mission Advancement Coordinator at Luther Home of Mercy) have two sons Aidan and Shane, who are both Genoa Comets. The O’Briens enjoy spending time together as a family (whenever they can find it), especially traveling to new locations, camping, and seeing God’s beautiful creation. 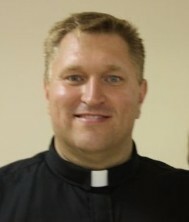 In addition to his responsibilities at St. John, Pastor O’Brien is also involved in the Genoa Ministerial Association, he is one of the North Central Conference Triad coordinators, he has served on the Northwestern Ohio Synod Council, the Southern Ohio Synod Worship and Music team, the Mission Strategy Team for Congregational Services, also in the Southern Ohio Synod, and variety of other committees and boards. In his free time Pastor O’Brien enjoys reading Science Fiction (inspired by a love of Star Wars), biking, swimming, and hiking. You can contact Pastor O’Brien by email here. LisaAnne joined the staff at St. John in April 2016 after a 30+ year career in Public Service. She lives in Graytown with her husband, Gary and two “fur-babies” Lola and Karma. She and Gary have 4 children- Nathan, Heather, Melissa and Bob and 5 wonderful grandchildren. 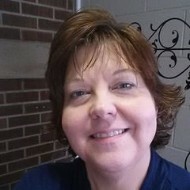 LisaAnne has been active in her church for several years as secretary, treasurer and lay leader and has been blessed to bring those experiences to her position at St. John. In her off time, she and Gary enjoy travelling to Amish country, working at the local Food Pantry in Elliston, gardening, farming, and walking with their dogs at different parks in the area. Please stop in the office and say, “Hello!” The coffee is always on! Tami is a life-long member of St. John. She started playing the piano for Sunday School when she was 9 years old. Tami has been part of the Saturday music team since its creation and is always ready to welcome new voices into the group.